Several personalities have committed to play in the charity game, among them La Salle star Jeron Teng, KIA player LA Revilla, and boxing hero Manny Pacquiao. A CHARITY game in honor of the late San Beda Red Cub Greeco ‘Coi’ Mendoza and organized by friends led by College of St. Benilde stalwart Anton Altamirano is gaining a lot of support. 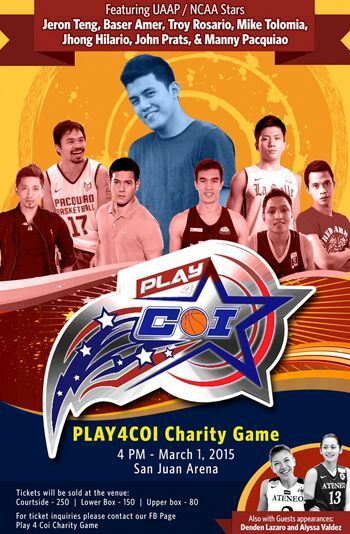 Dubbed “Play4Coi Charity Game’, the event set on March 1 at the Filoil Flying V Arena in San Juan was initially meant to help in the treatment of Mendoza in his battle with lymphoma. Mendoza, however, died over the weekend at the age of 24. Altamirano said they are pushing through with the charity game as a final respect to his former high school teammate and at the same time help his family pay the hospital bill which piled up to at least P2 million during his treatment. Altamirano said Mendoza was aware that the charity event was being held. “Hindi na siya makapagsalita pero he was happy with it,” he disclosed. Altamirano said Mendoza was in and out of the hospital due to tuberculosis after graduating from Adamson in 2012. The family learned that he was suffering from lymphoma just last December. Altamirano had fond memories of his former teammate. “Very happy person. Talagang funny. Siya nga ang komedyante sa amin. He was fun to be with and a loving person,” said Altamirano, who is set to graduate from St. Benilde this March. Altamirano said he is happy a lot of players as well as showbiz personalities have confirmed their participation in the game. The list includes Jeron Teng, former San Beda Red Cub Baser Amer and LA Revilla, Troy Rosario, and showbiz celebrities like Jhong Hilario and John Prats. Manny Pacquiao, Altamirano said, has also confirmed to play during the charity match through the help of Revilla, his player at Kia Motors in the PBA. Aside from the centerpiece Red vs. Blue game, a slam dunk contest, an auction, and halftime performance will also be held during the event. All proceeds, including sales from tickets ranging from P80 to P250, will also go to the family of Mendoza. Donations are also accepted. For details, check facebook.com/play4coi.